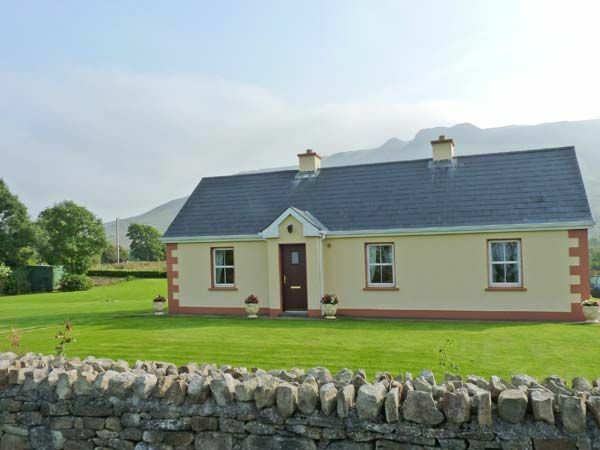 Tieve Baun is a delightful, detached cottage, situated at the foot of the Tieve Baun Mountain, near the hamlet of Ballintrillick. The cottage can sleep six people in two double bedrooms, one with an en-suite shower room, a twin room, and a family bathroom. There is also a kitchen with a dining area, and a sitting room with an open fire. Outside, enjoy glorious mountain views in the garden with furniture, perfect for alfresco dining, and there is off road parking for four cars. Close to Sligo's stunning coastline, Tieve Baun is the perfect base for families and friends exploring this spectacular region, all year round. Amenities: Oil central heating with open fire. Electric oven and hob, microwave, fridge, freezer, washing machine, tumble dryer, dishwasher, TV with Free-to-air channels, DVD, selection of books, games and DVDs. Fuel, power and fuel for fire inc. in rent. Bed linen and towels inc. in rent. Cot and highchair on request. Off road parking for 4 cars. Front lawned garden, large rear lawned garden with furniture. Sorry, no pets and no smoking. Shop and pub 4.3 miles. Town: The village of Kinlough lies between the beautiful Darty Mountains and the Atlantic Ocean. There are many amenities in the village such as pubs, shops, restaurants, a takeaway and folk museum! Nearby Lough Melvin provides superb fishing opportunities and is a natural haven that wildlife enthusiasts will enjoy. A wonderful base for enjoying Leitrim, Donegal and Sligo. All ground floor. Three bedrooms: 2 x double (one with en-suite shower, basin and WC), 1 x twin. Bathroom with bath, shower over, basin and WC. Kitchen with dining area. Sitting room (seats 5) with open fire. Oil central heating with open fire. Electric oven and hob, microwave, fridge, freezer, washing machine, tumble dryer, dishwasher, TV with Free-to-air channels, DVD, selection of books, games and DVDs. Fuel, power and fuel for fire inc. in rent. Bed linen and towels inc. in rent. Cot and highchair on request. Off road parking for 4 cars. Front lawned garden, large rear lawned garden with furniture. Sorry, no pets and no smoking. Shop and pub 4.3 miles.